SCMA Photo#861 - Pender Harbour, circa 1920. The Sechelt village on Skardon Islands at the entrance to Pender Harbour. Photo by A.P.Harrold. The Pender Harbour area was once the winter capital of the Coast Salish nation, specifically the shishalh tribe, from which the town of Sechelt takes its name. Judging by the wealth of archaeological evidence, the local population in 1800 was greater than it is now. The shishalh people were highly industrious during the summer months, fishing for salmon, hunting venison and gathering berries, all of which were dried for winter use. They built large dugout cedar canoes and huge communal longhouses (up to 800 feet in length) with separate family compartments divided by cedar screens. Examples of watertight baskets made from spruce root, aprons made of deer hide or woven cedar bark, blankets of mountain goat wool and fishing line fashioned from stout nettle fibre are further evidence of their creativity and diligence. Winters were a time to celebrate, and Pender Harbour was the gathering place for the many tribes of the larger Sechelt Peninsula area. Dances and potlatches lasting weeks or months, spiritual coming-of-age rituals and performances by medicine men helped to pass the long cold months. A severe smallpox epidemic in 1862 nearly eliminated this thriving people, and the introduction of the residential school system was an attempt to destroy what was left of their culture. The earliest contact between the Native peoples and European settlers was likely with Father Leon Fouquet, a Catholic missionary who arrived at the shishalh settlement of Kalpalin in Garden Bay in 1859. He and his successor, Father Paul Durieu, began the controversial residential schools in an effort to convert the Natives from their traditional beliefs. Although a royal proclamation in 1793 acknowledged the Native's continuing ownership of all the land they had traditionally occupied, in 1859 the colonial government began allocating limited reserve lands to the Native peoples in order to open the remaining land for white settlement. There continued to exist an on-going tension between the Natives and the encroaching white settlers over land ownership. A legend persists that the first non-Native to occupy the Pender Harbour area was a Chinese who began a fish saltery at the mouth of what became Irvines Landing. An Englishman known as Charlie Irvine (for whom the Landing is named) is more commonly recognized as the first settler. Irvine built a log trading post at the Landing, then joined the excitement of the Klondike gold rush. He sold his property in 1904 to an enterprising sailor and fisherman, "Portuguese Joe" Gonsalves, and his North Vancouver Salish Nation wife, Susan Harris. Joe and his son-in-law Theodore (Steve) Dames (a burly Russian seaman married to the Gonsalves' beautiful daughter Matilda) really developed the area. They built a deep-sea dock, general store, post office and hotel/saloon at the head of the wharf. The Union Steamship Company made this a regular stop, the beginning of Pender Harbour's real presence on the map. SCMA Photo#595 - Bargain Harbour, Pender Harbour, c1946. The Warnock family fleet of fishing vessels, then the largest of the local fleets of fishboats. "...the place was polluted with herring, you'd kill a thousand of them just rowing to shore, clobbering 'em with the oars, you couldn't help it...". Photo by Charles Bradbury. There were settlements of Japanese families in Pender at this time and several colonies of Scottish farmers and fishermen. Because of the difficulty in making a living, the area became known as Hardscratch. Business continued to develop, however. George Duncan started a blacksmith shop in Duncan Cove, and Harry Dusenbury opened a machine shop, boat repair and sealing operation on Dusenbury Island in 1905. Robert Donley began a chicken ranch on Edgecombe Island. To market his eggs, he paddled canoe loads of them out to passing steamers for delivery to Vancouver. He later started a herring kippering operation and store at Donley Landing and became an agent for the All Red Steamship Line. In 1912, Donley fathered the first male child of European heritage born in the area, William Emmond Donley. Farming was introduced to the area by German immigrants named Klein who settled one of the few parcels of arable land in the Pender area (now the site of Roosendale Farms, a successful hydroponic greenhouse operation). The Kleins built dykes against the tides, planted beets, berries and potatoes and cultivated oysters. The oysters were not the small native variety but were introduced from Japan by a Vancouver doctor. They thrived in the tidal flats now known as Oyster Bay and spread into most of the rest of Pender Harbour, hailed by some as the equivalent of manna from heaven. The oyster farm at Oyster Bay is still in operation. The Pender Harbour area became popular with the yachting set. The Rogers family (of sugar refinery fame) built summer homes around the harbour that attracted a stream of semi-famous, often eccentric visitors. Author Bertrand W. Sinclair, known for his best-selling western novels, moved to the area now known as Sinclair Bay. He lived in the area all his life, changed his novels' subject matter to fishing and logging, and eventually gave up writing to take up salmon trolling. Spiritualist Stewart Edward White and Erle Stanley Gardner of Perry Mason fame were also regular vacationers. A colourful character named Elizabeth Smart disembarked from the Lady Cynthia in 1941 to take up solitary residence in the old Irvines Landing schoolhouse. She became a local enigma, laden with trunks full of evening dresses and, soon after her arrival, obviously pregnant. It turned out she had left her home in Upper Canada, travelled the world, lived in Mexico and California and been involved in a steamy love affair with a married English poet whose child she was carrying. He visited her only once in Pender. This heartbreak was the catalyst for one of Canada's most celebrated novels, By Grand Central Station I Sat Down and Wept. In the last stages of both her book and her pregnancy, Smart was taken in by an equally eccentric local, Maximiliane von Upani Southwell, a "titled Austrian aristocrat who had chucked the debutante scene in Vienna and somehow ended up living with her invalid husband and 10-year-old son in the Klein family's original log cabin at the head of Oyster Bay, on the dole, but with immense elegance." Smart's book is dedicated to Maxie Southwell, who remained her lifelong friend. Logging began to develop as early as the 1870's and gained real momentum around 1905 when the Swedish P. B. Anderson set up large railroad camps to harvest the Douglas fir on the slopes of the Caren Range. Lumberman's Arch in Vancouver's Stanley Park is constructed from some of these then-massive specimens. The only medical presence in the area until after the war was an American doctor named Howard who had earlier lost his license due to malpractice. His advice was still sought, however, and he continued to practice illegally for years. Anglican minister Reverend Alan Greene of the Columbia Coast Hospital organized the building of the Garden Bay Hospital, officially opened in August, 1930. The Depression years hit the Pender area hard. 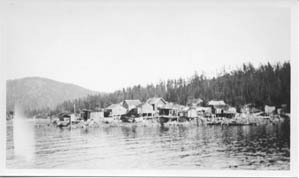 Federal relief camps were opened in Wood Bay and Silver Sands, where destitute men were put to work completing the road from Sechelt to Pender Harbour. Until this time, there was no land access to points south, except for the trail along the telegraph line (in service as early as 1910). The road was pushed through to Garden Bay and Irvines Landing around 1936 but was not paved until 1957. Up Jervis Inlet, the Princess Louisa Inlet area was first settled in 1900 by Herman Casper, a German army deserter who homesteaded the flat area at the Inlet mouth by Malibu Rapids. He did blacksmithing for local loggers, composed and performed songs on his zither and raised some 26 cats. He was joined in 1909 by Charles (Daddy) Johnstone and his family. Johnstone's sons, Steve and Judd, made frequent forays into the wilderness with nothing much more than a knife, where they stayed for weeks exploring the interior. They spent most of their lives in the Jervis/Princess area. Thomas Hamilton, an aviation tycoon, bought Casper's acreage in 1940 for $500. He built a luxury resort for Hollywood visitors but abandoned the project and sold his interests in the Princess Louisa Inlet in 1947. The property was purchased by Young Life, a non-denominational church group who still runs a summer camp there for youth. Hamilton is survived by family in the Seattle, Wa. area. 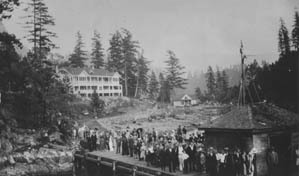 SCMA Photo#136 - The dedication ceremonies for the Sunshine Coast's first hospital, the Columbia Coast Mission's St. Mary's Hospital at Garden Bay, August 1930. Lieutenant Governor R. R. Bruce formally opened the institution. 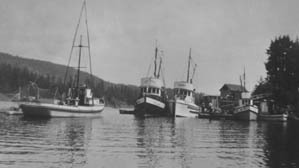 "...in those days, loggers injured in Jervis Inlet or even down the coast as far as Halfmoon Bay would be taken by small boat to Irvines Landing where they would have to lie in the freight shed until the next steamer arrived, perhaps a day later, in order to get to hospital in Vancouver. Too many of them died before a ship arrived and so the logging and fishing communities resolved that a hospital must be built in Pender Harbour...". Photo by Gilbert Lee. A wealthy American prospector named James (Mac) MacDonald visited Princess Louisa in 1919 and was so inspired by its beauty he determined to buy it. He acquired the 292-acre site from the BC government in 1927 for the kingly sum of $420. Fortunately, Mac simply enjoyed the Princess with no desire to exploit it. He determined to maintain its natural beauty and worked hard to eventually have it declared a protected marine park (in 1964). MacDonald is responsible for designating most of the current place names in the Jervis and Princess Louisa Inlet areas. Mac was a dedicated loafer and actually wrote a creed on the art of creative relaxation, which says, in part: "The world needs ten million full-time, thinking loafers dedicated to the purpose of bringing this cockeyed life back to its normal balance." He was always ready to open his luxurious boat to passing sailors and local curiosity seekers for an evening of story-telling, true or otherwise. He often entertained Muriel Blanchet, who sailed the coast for years with her five children and later published a well-known account of her travels, The Curve of Time. See also the Pender Harbour Living Heritage Society.